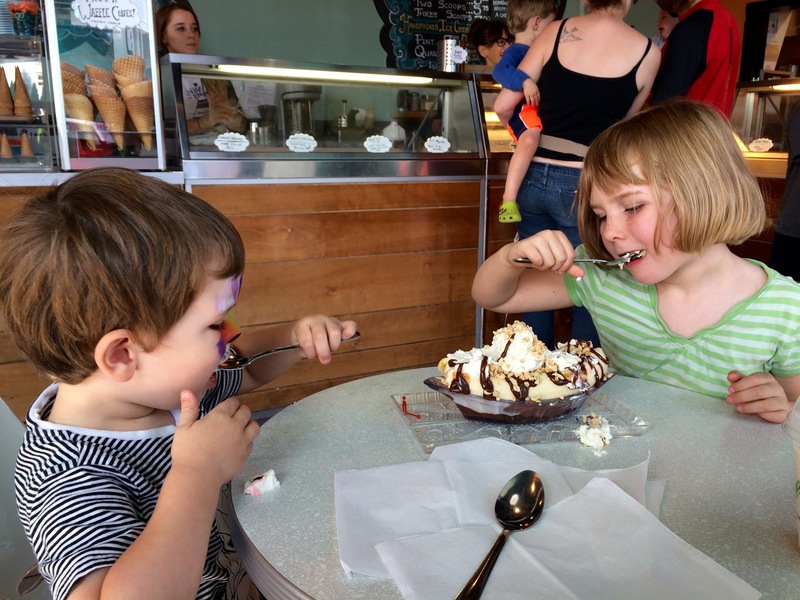 After hitting the Columbia Employees’ Store yesterday, we made good on a promise I had made to the children ages ago, which was to buy them a banana split at Cloud City Ice Cream. Three scoops of ice cream: vanilla, circus friends, and (since they were out of normal chocolate) salted caramel chocolate; also, hot fudge, peanuts, whipped cream, a banana of course, and two cherries. Amelia was disappointed in her first banana split. She did not enjoy the salted caramel chocolate ice cream and also didn’t love the peanuts. Baxter enjoyed it more (and ate more of the banana), but ate himself sick. I’m trying to eat healthier so I didn’t help as much as I normally would have. 🙂 That said, I think every childhood should include a certain number of banana splits, and I’m sure we’ll find a style that Amelia likes eventually.